Mango, the country’s national fruit is considered as one of the finest in the world. It is the third most important fruit crop of the country based on export volume and value next to banana and pineapple. It has an established domestic market and has bright opportunities for the international market both in fresh or processed form. The country’s export variety, The “Carabao Mango” is one of the best varieties in the world. But in order to harvest enough quantities for commercial purposes, you need to have a large land area to plant the trees. And as we are all aware of, mango trees are big and tall so the the harvesting will require labor cost that might not be feasible or might reduce our profit. And in addition to those disadvantages, harvesting is also time consuming and if we will use pesticides bigger trees will cost you more. So what is the solution then? we have to make trees smaller to reduce the overhead expenses. 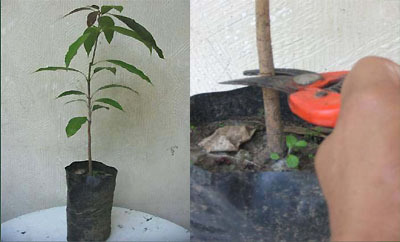 The following is how you create a dwarf mango tree by the technique of LOW BARK GRAFTING AND PRUNING OF MANGO TREE. Propagation by seeds results to enormous variability in the progenies. Therefore, asexual or vegetative methods are adopted to get true to type plants. 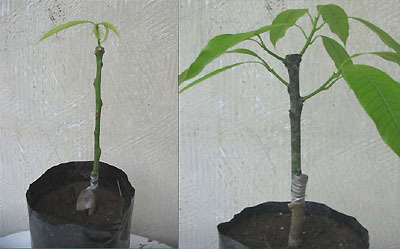 Prepare a mango root stock, it’s a mango seedling having a stem big enough to be grafted as shown in the picture below. Prepare the scion and cut the leaves. Only the stem should be left. 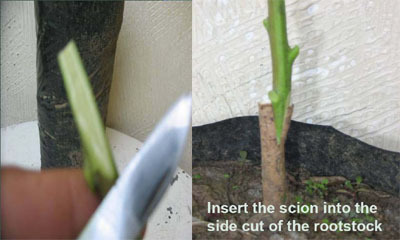 Make a V-shape cut on the end of the scion stem. Insert the scion into the side cut of the rootstock. 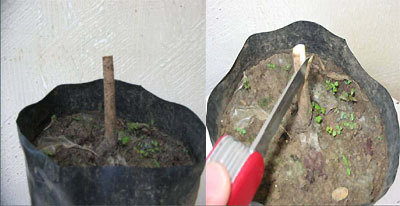 Wrap the joint of the rootstock and the scion tightly using a plastic strip. Decapitate the apex to induce branching. Pinch-off the growing point to induce branching. After 30 days expose the plants to little sunlight for hardening. There you have it. It looks simple enough but I think the waiting is the hardest part. But after the many months of waiting it to grow, it will look like the picture below. Maybe after six years it will bear fruit and ready for mango fruit production. Previous: Do Businesses Need CRM or Customer Relationship Management? I understand you need a rootstock compatible with the scion being grafted. I will be forever grateful if you could provide information as to where rootstocks can be obtained in the Philippines. More power to you. I am still waiting for information on where to receive practical training in the Philippines on how to dwarf fruit trees. @Nelson I’m sorry there are no training available on dwarfing mango trees in the Philipines. Please, I wish to receive training on how to dwarf frut tress. Where can I obtain this training? Can you contact DOST-PCAARRD for some information regarding agricultural research and development. I think they have brochures for horticultural techniques, seminar and training in the field of agriculture. I want to grow a large ultra high density mango orchard in Florida, USA using cultivars from Pakistan. Is there a root-stock that is dwarf in its characteristics or the dwarfing happens only as a result of low grafting and/or pruning. 2. Can I induce flowering/fruiting within 2 years and every year? I am from Bhutan. I have planted grafted mango in my garden. I want to learn to do grafting. I need a training. Please kindly help me where can I get help? wow, amazing! ganito pala idwarf ang mango, so helpful thank you! PAUL, IF YOUR MANGOES ARE PLANTED FROM SEEDS, THEY USSUALLY BEAR FRUITS FROM 10 TO 15 YEARS. 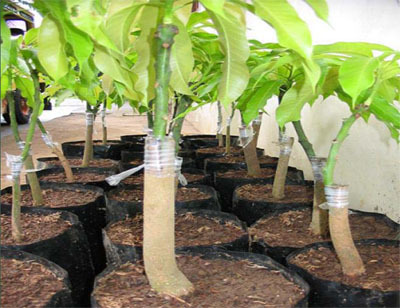 YOU COULD LET THEM BEAR FRUITS WITHIN TWO YEARS BY TOP WORKING THEM WITH A CLEFT GRAFT OR ANY OTHER GRAFTING METHODS, WITH A CHOCANAN CULTIVARS FROM THAILAND. 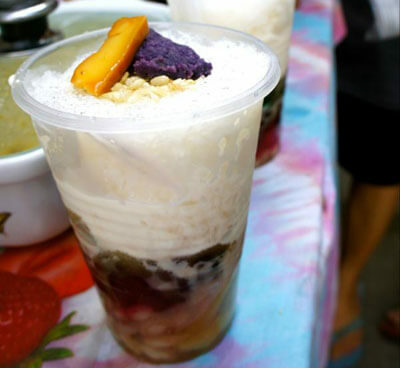 I HAVE TRIED THIS AT SISON, PANGASINAN AND IT WORKED. I would like to be updated via your newsletters. I am very much interested in Agriculture and Agro Business. Was trained on how to rear Grasscutter, Snail and Catfish. Hope to hear from you soonest. fred,, yes its true that calamansi is not compatible with avocado..you can graft or bud calamansi to any citrus family.. 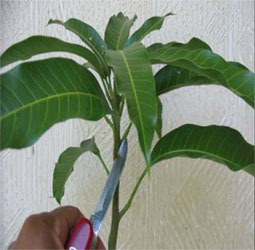 If your mango tree is standing alone and far from other trees or fence, prune the lower branch of the mango so the nasty squirrel could not jump from the ground to the branch, then try wrapping the trunk snug fit with a galvanized thin sheet metal from about a foot from the ground to about 36 inches upward. The sheet metal is slippery, hopefully this would solve your problem. Pls let me if it works. Squirrels are eating my mango? Do do you suggest I do to protect them? I tried grafting roses in my garden in San Francisco, CA . I grafted 10 scions, only one was successful. I do not know what I did wrong. But my suspicion is that I have a bad scion. The successful one is going to have flowers, a small flower variety with five or more flowers in one stem. I do not know what kind of rose it is. The rootstock bears bigger flowers one flower in one stem. I tried grafting a calamansi scion to a avocado and apple tree. Did not do any good. I suspect they are not compatible. Please give some input. I WANT TO PUT UP A MANGO FARM. CAN ANYONE LEAD ME TO WHERE I CAN OBTAIN TRAINING ON MANGO TREE DWARFING TECHNIQUES. what is your problem in particular cheryl? im cheryl mae i have a problem this activety can you help me……………………………………………. Try to contact Ka Bernie–09175114404. He personally will tend to his babies. TRY TO VISIT INSTITUTE OF PLANT BREEDING(ipb) in Los Banos., Laguna. Malay0 na dito sa Davao. I saw your reply to Mr. Kanti Patel that a Kent mango is availble at Davao. There are Kent mango fruits for sale here in Chicago, Illinois USA from Mexico. This mango is very delicious like the chocanan from Thailand. I am interested to obtain a scion from your orchard to graft or to top-work into my seedlings at Sison Pangasinan. Hey, we go to the same guy. Very sweet himself, Ka Bernie. Dont despair. If the branches are pencil size you could TOP-WORK with a Cleft Graft with any good variety of Carabao Mango. If the branches are now too large i.e.,2 or more inches in diameter cut the branch with pruning saw,but leave a nursing branch to manufacture its food. Wait for 6 t0 8 months for a new branch to sprout,leave 3to 4 branches by pinching off the rest. AS the new branch are pencil size then cleft graft. Try to find A Thai CHOCANAN cultivar that bear fruits in two (2) years. I have lots of Chocanan scion in Sison ,Pangasinan. There chocanan scion also available from Bernie Dizon at Magalang, Pampanga. I LIVE in Illinois,USA going to Sison by September . If you want more info,pls email me. sir, several years back we planted some grafted mango trees to our farm but unfortunately the grafted part dies and only the rootstock survived to become “manggang bisaya” as my mother would say..can we still graft that tree with the carabao mango variety or shall i just have it uprooted and plant a newly grafted seedling? sayang po kasi yung puno…please help! yes u can do it again, first what you should know is try and protect it from sunlight for at least two weeks and also after you do it it will require much water, and the best time to do it is when the weather is a little warm or hot so that it will shoot in good time, i tried it last two weeks and they are all successful though i am in west Africa. it is now raining but is our best time now. I am from North India. I tried two time to get a bark grafted mango plant. Both time I got failed. I don’t understand the reason. I tried to do the things same as mentioned the tutorial. Some where I did mistake that I am not able to find. Please suggest some good suggestion to get success. One more thing – can you suggest in which month I can try it in North India? leave in UP faizabad have 20 mango trees,12 gouva tree ,im also intrested in lemon have 15 on grafted plant .but they are not grow as i think but ,i dont know also how to care them i have no idea to mentain them but im very intrested in plantation .I have also meny typr flower but also i am unable to taking care my rose plant any how……. Thank you Mr. Veer Loquias for mentioning the heaviest mango in the World that was already certified by the Guinness World Records and featured in page 144 of the Guinness World Records book – 2011 Edition. I learn alot from this website and i could apply this much info into my farm. More power and hope to learn more. Hello Mr Patel. Your name is very common in India. Haden and kent are famous in Florida. We have also planted haden and kent here in Davao City, Mindanao, Philippines. We have also the heaviest mango in the World which is planted in Iligan city, Lanao del Norte. This is already registered in Book of Guiness. I am looking for 10 mango trees for my yard. I am looking for haden or kent mango trees. If 3 gallon plant also ok for me. Please let me know where I can get it? and how much cost for each plant?diwata zamasta (texas)has 5 ft. trees in a pot in a farm? is this a rootstock or dwarf mango trees. 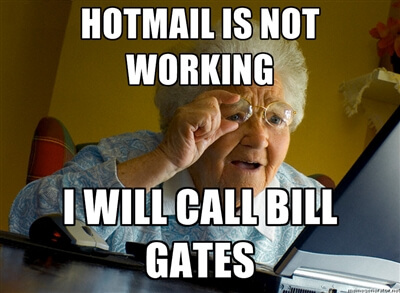 send me a email. Please. 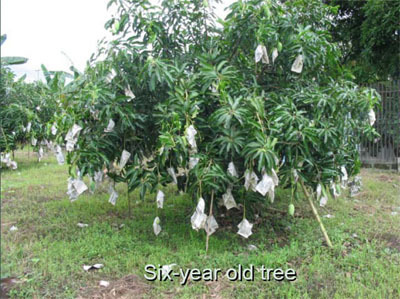 You can grow mangos with bigger sizes of bags or pots. Putting covers after grafting is a standard practice especially during rainy season.Covering in any form or material will protect the graft union from absorbing water which cause its death of the grafts. Grafting on big trees can also be done but you need to use rubber bands for tying the union for better and faster callus or approach.If tying is loose, then grafts will die. The size of the scion can be pencil size for small 6-12 months old rootstocks using the cleft grafting method and for bigger rootstocks you can adopt low bark grafting. We had planted 8 mango trees bought from one of our nurseries here in Pangasinan. I’ve seen that the young leaves are falling. I really don’t know what to do. Kindly tell me what insecticide should I use to kill the insects. Any information please. Thanks. I live in Texas and have 45 mango tree about 5 ft tall in a pot. Our farm has snow every year. I am afraid to transfer these plants to the ground, they might die. Can I grow mango in pots and would they bear fruits? Well, if they are already planted on the ground, can we try covering them to protect from direct sunlight until they recover? Much like putting a tent over the newly grafted tree. I think Bernie Dizon did this in Mr. Capulong’s orchard. He more or less made a Batangas tree into a chokonan(?) tree. Is pencil like diameter is good for grafting, is there such a thing as too big to graft? Can we do this on a branch instead of directly on the trunk? I TRY DOING THIS IN ORCHARD TWO TIMES NOW, THOUGH THE PLANTS ARE ALREADY PLANTED AND THEY ARE ABOUT TWO YEARS, AND EACH TIME I DO IT , IT WILL DRY AFTER ABOUT 3WEEKS. IS THERE A WAY OUT FOR ME TO DO IT? WHICH IS SUITABLE FOR THIS? Is there any way to graft 4 yr. old trees already planted on the ground? Sorry wala po akong alam na nagbebenta ng mango tree. 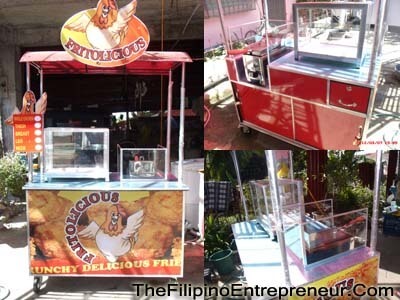 Siguro baka may magvisit na seller dito sa post ko. Ahhh. Makes sense. Thank you! Can someone please tell me….What are the plastic bags for on the growing fruit? I have seen this in Hawaii also and assume it protects the fruit from something but not sure. It’s for protecting the fruit from bugs. Hats off to your company. This Website is really a plus to novice who can learn how to graft. small tree big mangoes with sweet test like in india totapuri. best for all time..
Hi! I tried grafting with a mature tree. I cut about an inch deep into the bark (it’s pretty hard). Is that deep enough for my grafted branch to survive? How about 4 year trees already planted on the ground. Can we still apply the bark grafting? Just contact me in this adress. I have visited India twice in Gujarat and Marahastra. The variety of mango famous in the locality is the Alphonso and Kesar.This varieites are good in quality. I was there to visit the growers of Desai Fruits and Vegetables and Cold Storage in Navsari, Gujarat.That was in the year 2005 and 2006. If you have some inquiries just send your questions. Thank you and more power. Training and pruning? Do you mean always cutting off the top part? Do trees always survive low bark grafting? I’m in the process of drying a couple of mango seeds. Do they have a chance if the mangoes were stored in the ref? Chris, yes you can control the height of a tree like mango through training and pruning. Edmund. you can buy Nam Docmai mango from Lolamarge Fruit Nursery located in Mintal, Davao City,besides Petron Gasoline Station. Good article. I haven’t really tried so I have a couple of questions. Can we dwarf any mango variety? While we’re at it, can the same principle applied to most trees? How’s the survival rate when you do low bark grafting? Do you also have a feature on how to propogate more mango trees from one tree? Where can I purchase low bark grafted Nam doc mai? just a few pieces. Thanks. LOlamarge Fruit Nursery in Mintal, Davao City(Davao-Bukidnon Road are selling Low-bark grafted plants.Chokanan and Guimaras variety are also available. Potassium Nitrate can be used as foliar spray for flower induction at the rate of 2-3 percent.Chicken dung or Vermicast can be used as organic fertilizer. We have 30 mango trees in our small farm in Antipolo. I just wanna ask if anyone who knows someone who does contract in mango spraying…? And how much if you can tell? My email: [email protected]. What kind of insecticide/fungicide to use in grafting mangoes? I have a 5-year old mango from seed and I want it to bear fruit in two years time. Where could I get a Chocanan from Thailand and Guimaras scion. will these dwarf trees can survive and produce good fruits if i plant them in large plant box? Shoot borer can be controlled by spraying any insecticide recommended for mango ( Pyrethroids). Spray the insecticide at the onset of flushing or emergence of the new leaves. Hoping that you will solved your problem. I have planted 4 mango trees and it is into its 5 year now. Have began to take an interest to care for it now. I discovered that the stem or branches have a lot of stem borers which makes the stems hollow. Any suggestion to cure the trees? Thanks. Thanks so much for the info I was always wondering how do they do it now I put hands on practice… Thank You…. 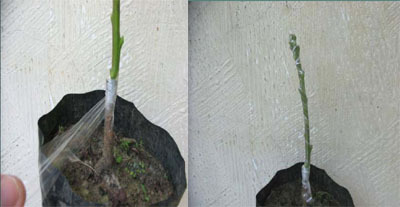 The mature shoot usually pencil size can be used for grafting. When it is mature, the leaves are dark green and shiny.Hope you can find the best shoot. Its really good information. i was searching this information from many years. i hope i can also do it. Im growing 2 mango trees and they are growing pretty fast, they seem healthy. I plan to graft them. Can you give me an idea on where to get the mature tree bud/branch so I can use to graft them with? ?